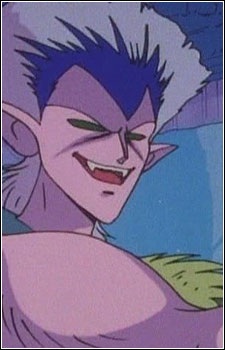 Vampire was the first Cardian to appear in Sailor Moon R. She appeared in episode 047. Her mission is to steal human energy for the aliens Ail and An, who need it to survive. Vampire's specific purpose is to steal the energy of young girls in love, which seems to be especially potent. After being called upon, she immediately went on a nighttime rampage throughout Tokyo, attacking any young female she encountered. Luna and Artemis saw one attack and attempted to track the Cardian through the city. Naru Osaka, who was speaking to Usagi on the phone, witnessed one of the attacks in an alleyway outside of her window. The Cardian quickly spotted the young girl and entered the window to attack her. Vampire strangled Naru with vines and begin draining her energy, causing her to drop the phone while begging for help. Soon, Luna and Artemis leapt through the window, but were ultimately unable to protect Naru. Though they realized they were unable to handle the situation alone, they were hesitant to call upon Usagi, who no longer remembered her life as a Sailor Senshi after defeating the Dark Kingdom. Usagi, however, did manage to arrive on the scene: she had realized that something was wrong, and came to help her friend. Seeing the Cardian was terrifying, but she decided this must be a dream and attempted to confront Vampire anyway. Vampire was not deterred at all; she began attacking Usagi instead. Artemis leapt to the rescue, clawing at the Cardian's face and causing her to release Usagi. He caught the monster's attention and lured her away from the scene before Usagi was completely drained of energy. Luna struggled with the decision of whether or not to awaken Usagi as Sailor Moon. She ultimately realized that this would be the only way to stop Vampire, so she revived all of the girl's memories. Artemis soon became a victim of the Cardian, who caught him and began draining his energy. Sailor Moon soon arrived on the scene and intervened. Vampire quickly released Artemis and began attacking the girl instead. Sailor Moon was initially able to avoid the monster's attacks, but was soon captured. She tried to reach her tiara, but was unable to gather the strength. Luckily, Luna bit Vampire's arm, causing her to release the young girl. Sailor Moon rose to her feet and destroyed Vampire with her "Moon Tiara Action" attack. Vampire had green eyes with no pupils, blue hair, and purple skin. She had the ability to leap at extraodinary heights and was very agile on her feet. Rather than a right hand, she had a red flower from which she could estend two tentacle-like prehensile stamens that were used to drain energy. Her name is clearly derived from the word "vampire," a mythical creature that drains victims of their blood (much like the Cardians drain victims of energy).